In Tikhonravov Crater. Tikhonravov is 386 kilometers in diameter and was named after Mikhail Tikhonravov, a Russian rocket scientist. It’s thought to have once held a giant lake that drained into the 4,500-kilometer long Naktong-Scamander-Mamers lake-chain system. 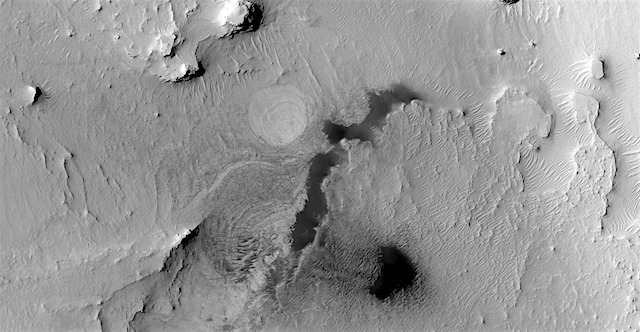 This entry was posted in Reports and tagged Beautiful Mars, crater lakes, High Resolution Imaging Science Experiment, HiRISE, Mamers Valles, Mars Reconnaissance Orbiter, MRO, Naktong Vallis, NASA, Scamander Vallis, Tikhonravov Crater, University of Arizona. Bookmark the permalink.